Casio SA76 Review - Are you ready to learn more? The Casio SA76 is a 44-key, kid-sized powerhouse, but not without its limitations. We’ll walk you through the good, the bad and the ugly of the SA76 in our Casio SA76 review. At first glance of the features, this little keyboard doesn’t necessarily give away that it was made for kids. It’s sophisticated with almost as many options of settings as some traditional digital keyboards of its size. So, is it any good? Is it better suited for a kid or an adult? Can it work for both? Well, that’s kind of a hard question to answer, because it depends on what you’re looking for. We’ll walk you through the things that we love and the things we don’t love so you can make that decision yourself. The thing that we love most about the SA76 is that it is absolutely tiny. Weighing just 3.7 pounds and measuring 23.8 inches in width, 8.3 in depth and 2.24 in height, it’s quite small. That small size doesn’t leave anything to be desired though, with 44 keys as well as a large LED screen and chock full of settings, the Casio SA76 packs a punch for its small package. In addition to the small size, the Casio SA76 can run on batteries. Just charge it up with 6 double A batteries and it is ready to be taken on the go. The LED screen features a few different learning options. First, in any situation, it shows which notes are being played, which is excellent for beginners still learning the basics. Secondly it has a lessons section which takes advantage of this setting to help beginners play through simple songs. You can also navigate the different settings and voices using the various buttons and number pad in conjunction with the LED screen. Another fun feature is the “percussion pads,” which are great for further music exploration. In addition to the many pre-set songs and voices, the percussion pads allow you to add a different range of beats in a partner experience. Also, we love that it comes with a couple different color options. You can get the Casio SA76 in bright green, orange, grey or pink. Surprisingly, the biggest problem with this keyboard is that the AC power cord is not included. Be careful because that means you can’t boot it up the minute you’ve bought it. You’ll need to have bought 6 double A batteries ahead of time or the separate AC power cord. The Casio SA76 is also a fair bit smaller than it may seem based on the pictures, especially for an adult user. It seems like it should span across your whole lap, but it sits more like a laptop for most adults. For a child though, it’s likely large enough. We also found that the volume slider is a bit finicky. For a child’s use, it’s really easy to accident change the volume, because it tends toward full-volume. For an adult, it can just seem loud, with mediocre sound quality. Although it comes with many voices, preset mixes and even drum beats, the variety is lost in mediocre quality. Many of the sounds seem like they haven’t been upgraded in a long time, and seem quite low-quality and electronicky, not authentic. We want to dedicate a whole section of this review to the keys, because for an advanced pianist, they will be the biggest issue with the Casio SA76. In addition to the overall smaller size, the keys are also tiny. 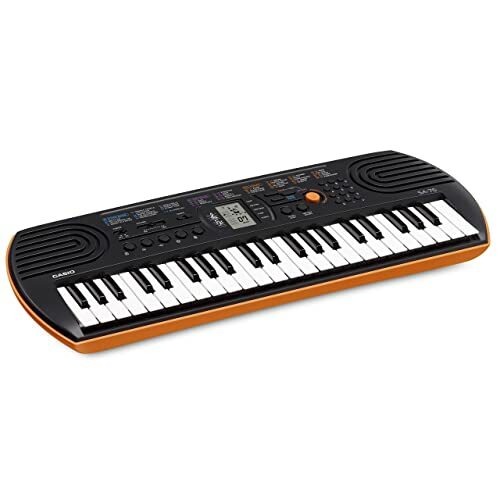 People with large fingers may find it difficult to play a clean rhythm on the Casio SA76 because they end up tripping over the small keys. There also are just few keys, which is likely better for a beginning learner or a small child, than a learner of a few years. If you’re okay with sticking within a few octaves, then this is probably okay for you. If 44 keys aren’t enough, then the Casio SA76 might not be the best option. The keys in and of themselves are also quite plasticky. One place where Casio did not put its money is in the feeling of the keys. The texture is characteristic of a child’s plastic piano – which, let’s admit, is what it is. The keys also lack pressure sensitivity, meaning that if you press them soft or hard, the volume is the same. Switching to a higher quality digital piano, stand-up or grand piano will be a surprise after using this because of the lack of touch sensitivity. They also are not weighted. Key weighting is a little bit more advanced and can come in many options. 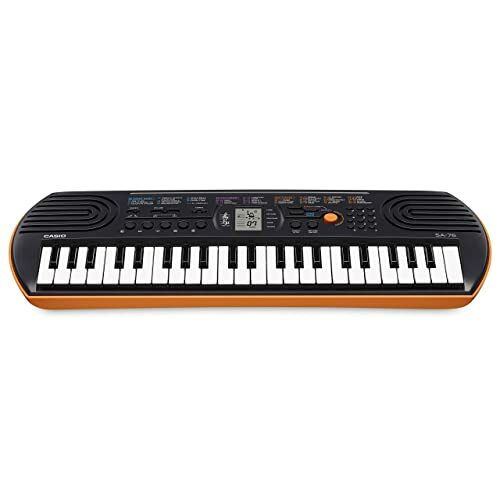 The Casio SA76 does not include any key weighting, which can also be an annoyance when switching to another piano. If you’re looking for another relatively small piano with excellent keys, you can check out some of our other reviews, including the 6 Best Portable Keyboards in 2019 which will walk you through other small options and the Best Cheap Keyboard Pianos of 2019 which looks at cheap options that still play well. Although the list of cons seems long, don’t let it scare you away from the Casio SA76. It can be an excellent fit for young learners and advanced players alike, given the right situation. Its biggest strength is its portability. Young learners looking to practice as much as possible will appreciate that. Advanced players that can’t part with a piano for even a minute or that are looking for an option to bring on the go, on vacation or in a backpack have come to the right place. The Casio SA76 is also a great option for children. It’s more advanced than most children’s keyboards, allowing for space to take advantage of the learning features and interesting settings, while still being fun to play with.